With GoBlissnet, you can bank anywhere, any time with any web-enabled mobile device. Go to www.blissfieldstate.com from your mobile browser and you will automatically be directed to our mobile-ready site. From there, tap the button for GoBlissnet Mobile Banking. It's safe and easy. Log in to your Blissnet Online Banking account. Select Options > Mobile Settings > Text Mobile Banking. 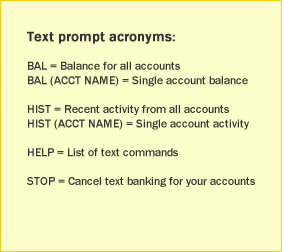 Enter your mobile phone number, select your provider, and select the accounts you want to access via text banking. Create a short name for each selected account. Accept the terms and conditions to get started. The amount of history displayed is based on your user defaults in the Display Options of Blissnet Online Banking. If you lose your mobile device, don't worry - no information from GoBlissnet is stored on the device. If you lose or get a new phone, you will simply register the new phone under Options > Mobile Settings in Blissnet Online Banking.